We were up in Maine this weekend, partly to give my parents their monthly Lilly fix, and partly to attend the 100th (!) birthday party of a dear family friend. Mr. Donnell lives by himself, plays Scrabble with my mom twice a week and volunteers at the local hospital. He says his secret is, “Just keep moving.” If that’s not inspiration, I don’t know what is. My sister was also in Brooklyn for a hot second and we made the most of it, with workouts, wine, and a cozy viewing of Jumanji. Listening, two ways: While I wouldn’t say I’m a goop person, I am consistently impressed by how strong their brand is, and how unapologetic they are about everything they do, from nutritional powders to jade eggs. It’s only fitting that when they launched a podcast the first guest would be…Oprah. It’s worth a listen if only to hear Gwyneth fan girl, and for Oprah’s trademark warm-hug reassurance that we’ll figure everything out. Rob and I also recently got into Wesley Morris and Jenna Wortham’s NYT podcast, Still Processing, which touches on culture, race, and our insane political landscape with no shortage of wit. They’re great together, and fun to listen to while still being thought-provoking. Going sockless: I’m over everything related to winter, including socks. That means I’m mostly running around in my Allbirds (which you probably know about but I highly recommend) and Sézane leather sneakers (streamlined enough to be worn with jeans and dresses). I’m also eying these Hobes flats, which basically look like slippers and will be perfect for travel—patiently waiting for the silver to come back into stock. Updating my breakfast: I love my Serious Eats-optimized scramble and She Wolf toasts but I’m so ready for spring fruit and vegetables. In the meantime, I’m experimenting with different breakfasts, including savory yogurt bowls (plain whole milk yogurt topped with cucumber, sun-dried tomato, olives, herbs, and plenty of good olive oil) and Japanese-inspired rice bowls with smoked salmon, brown rice, and hard-boiled egg. Instagramming for good: I recently came across @_stillwerise, an online auction that raises money for worthy charities. The items are all from independent designers (I discovered it via East Fork Pottery, one of my obsessions) and are highlighted in different instagram posts. To participate, just comment with your bid(s) and wait to see if you win. The current auction ends March 26th and benefits Everytown, Moms Demand Action, and Emily’s List. What are some non-obvious NYC cultural excursions? Even before we were dating, Rob was my go-to for unexpected New York field trip ideas. He’s the one who introduced me to the Museum of the City of New York, which is a small but powerful museum up on 105th St. Rob says, “The bonus for the Museum of the City of New York is the nearby Conservatory Garden in Central Park, which has three small formal gardens in different styles.” He also took me to the Donald Judd house in Soho, a time capsule of the artist’s home and workshop from the mid-1970s, when artists were making large-scale art in abandoned industrial spaces downtown (and you could buy a 15,000-square foot building for about $70,000). Is Peloton really worth it? How have your cooking and eating habits changed with a baby? Adult food = baby food: We’ve been giving Lilly tastes of things since about four months but she didn’t start really eating until seven or so. We tried a couple purees but she was more interested in our food, as well as feeding herself, so we switched to regular food pretty early on. 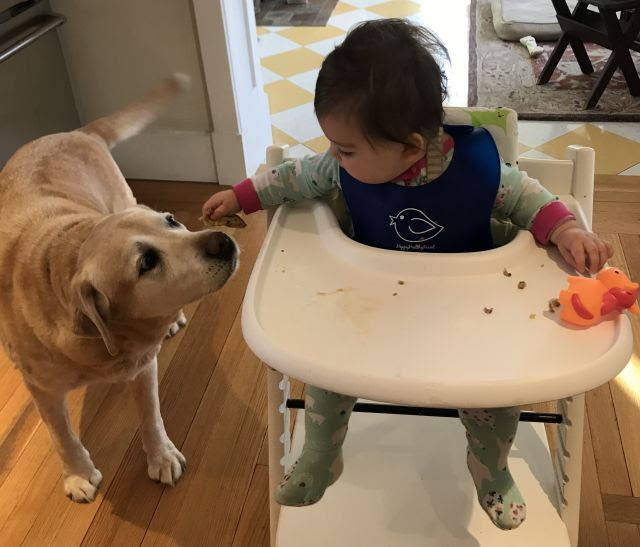 She eats basically what we eat—roasted vegetables, oatmeal, yogurt, avocado, chicken, salmon—just smooshed or broken into small pieces so that she can gum it easily. We also just put stuff in front of her and let her taste it, which is how she came to try sardines, fried rabbit, banana bread, polenta, and more. Shortcuts + planning: Even with how much we cook I rely on Raised Real way more than I thought I would. If it’s 6pm and I haven’t made dinner yet but she needs something to eat, I steam one of the packets and add some leftovers from the night before; or I make a couple meals in the morning so Jocelyn, our nanny, can add them to the kids’ lunch. (Note: I’m an advisor to the company; if you’re interested in trying, use code MOLLIE25 for $25 off). Planning is also key: We try to make building blocks (vegetables, beans, or grains etc.) on Sunday so that we have food for all of us throughout the week. Get in a rhythm: Lilly goes to bed between 7 and 7:30pm, so evenings are pretty compressed. In order to make sure we can feed her and ourselves, we know what we’re making for dinner ahead of time (this includes lots of Gchats, if you’re wondering) and I usually prep what I can since I have a more flexible schedule. When Rob gets home, Lilly has usually eaten her dinner (see point above) and he helps get her ready for bed, then I nurse her to sleep while he makes dinner. Our meals have gotten much simpler but we still cook at home 90% of the time. Early bird dinners: Before Lilly had a sleep schedule we took her to dinner all the time. Now we’re more likely to go out for a late lunch on the weekends or a super early dinner—which is actually pretty nice. We recently had dinner at Roman’s at 5:30pm and it was so lovely with the light streaming in and our pick of tables. Plus then you can be in your jammies before eight, always a plus. ​Bonus! Rob says: Don’t miss Lorde’s Melodrama Tour, the making of a career artist on her first headline tour since 2014. At 21, she’s amazingly self-assured as a songwriter, performer, and creative director, and this tour puts everything together into an fully-realized spectacle that also manages to be deeply personal. Bonus: Run The Jewels is opening all of the dates. Hear Lorde talk about her songwriting process and watch a stripped-down performance of Supercut to get ready. Have a great week and good luck to any East Coasters in the snow tomorrow!